The aurora camera is a digital one comprising three suites of independent interference filter, lens, and CCD. With this camera, we can simultaneously take spectroscopic images of the typical wavelengths of auroral emissions: blue for nitrogen-molecule ions, green for oxygen atoms, and red for nitrogen molecules. Inventions for use on the satellite are adoption of cosmic-radiation-tolerant material (quart) for the lens, and a natural cooling mechanism to cool the highly efficient, low-noise CCD down to 10 deg. C for the precise photography even of the dark auroral emissions. At midnight on August 30, 2005, the first power-on and initial operation of the aurora camera was implemented in the ISAS REIMEI operation room at Sagamihara City, via communications using the 3m parabolic antenna located on the top the building. The timing, as REIMEI passed over Japan at midnight, was selected in order not to damage the CCD with bright sunlight reflected off the ground. As we carefully watched the image data shown on the display, we saw the artificial lights of big cities moving on the screen. The room was filled with excited shouts of, “We did it!” The images moved on screen because the satellite flew at a speed of 7.5km/sec. Later, while repeatedly replaying images for a detailed examination, we discovered a thunder-like emission that we did not recognize initially. Found was an emission from a meteor, too. The camera is currently catching a variety of luminous phenomena other than auroral emissions in the terrestrial upper atmosphere. Fig. 3 presents a night view of the Tokyo metropolitan area at midnight on December 16, taken as a memorial photograph in the highest image-quality mode. Figure 3. 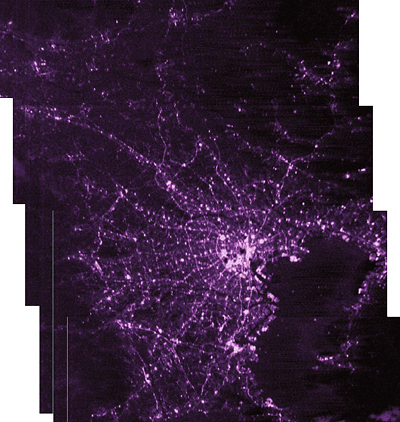 Photograph of the Tokyo metropolitan area at night in 670nm wavelength taken by the aurora camera onboard REIMEI. The photograph was with an about 200m spatial resolution. The ability to shoot such a night image is one of the excellent features of the auroral observation by the high-sensitivity camera. The camera’s initial operation was completed in just a few minutes because of its simple procedure: just power on the CCD-driving electronics and command/data-communication circuit and designate the observation mode. On the other hand, we spent more than three weeks on the initial activation of the auroral particle sensors, which use multiple high-voltage power supplies with risk of discharge accident. We performed the operation carefully to raise the output voltage gradually in each ten-minute-visible operation. Normal operation of the sensors became possible at the end of October. Fig. 4 shows an example of the initial observation data. Figure 4. Observational example taken on November 5, 2005, as REIMEI passed over the northern Scandinavian Peninsula. 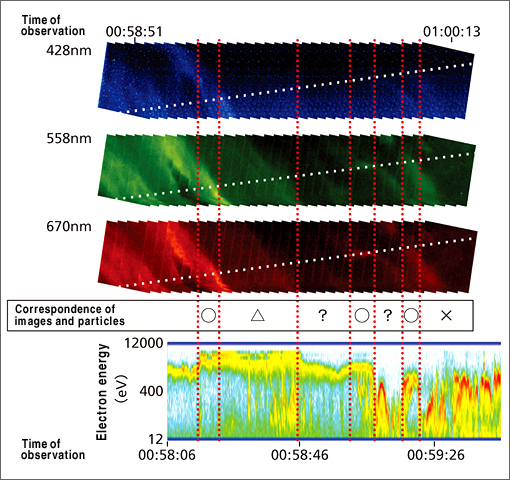 The upper three figures show composed images of auroras with three wavelengths caught by the aurora camera. The images of the auroral emissions are represented in blue for nitrogen-molecule ions, green for oxygen atoms, and red for nitrogen molecules. The bottom figure shows the number (in color) of auroral electrons detected per each energy level (vertical axis). In this example, the bright aurora and enhancement of electron energy and flux show particularly good correspondence, although there was a time delay of several tens of second in the observation time of the camera and the particle sensor. Observation by REIMEI alone is insufficient for the research on the connections between regions (multisphere interaction), such as the solar wind, magnetosphere, ionosphere, etc., in which the characteristic parameters of plasmas and magnetic fields vary greatly. It is important to conduct joint researches with various ground-observation networks and satellite observations at higher-altitude regions. Before the launch of REIMEI, we have planned and proposed joint-observation projects focusing on co-observations by auroral ground-camera networks, ionosphere radar networks deployed in the Arctic and Antarctic Circles, and currently active satellites such as AKEBONO. We have already begun joint observations with various ground-based systems and are conducting them every month. As auroral observation during the period of the new moon is particularly favorable for both satellites and ground systems, the observation schedule for the period is very busy. For those of us busy with the REIMEI operation around the clock every day, there is nothing better than the exciting expectation of, “What new scientific data can we see today?” For the time being, we must continue to spend days and nights at ISAS, or commute between ISAS and the universities to watch and operate REIMEI.